Doctor Siddiqui was knowledgeable and throughly explained what my issue, what the plan of action would be, and why we willtake that particular route. She also answered a lot of my paranoid questions with delight and did not make me feel foolish. Gave recommendations based on my financial situation. Doctor Siddiqui was knowledgeable and throughly explained what my issue, what the plan of action would be, and why we will take that particular route. She also answered a lot ofmy paranoid questions with delight and did not make me feel foolish. Gave recommendations based on my financial situation. Dr. Farah Siddiqui is a kind and friendly podiatrist. She earned her degree in podiatric medicine from the Rosalind Franklin University of Medicine and Science and then went on to pursue a residency at Loyola University Medical Center, Edward Hines Jr. Veterans Administration Hospital. She is also fellowship-trained in diabetic limb salvage at Georgetown University Hospital. 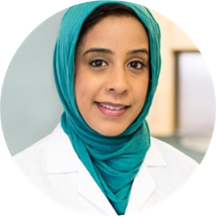 Dr. Siddiqui has a passion for practicing cost-effective, evidence-based, and compassionate medicine. She realizes surgical care is often warranted but should be thoroughly discussed with the patient. Her goal is to restore her patients’ health and strive towards their recuperation. Felt rushed and uncomfortable, specifically because I exposed my issue and I didn’t feel that it was examined or looked into. Seemed like an educated guess.